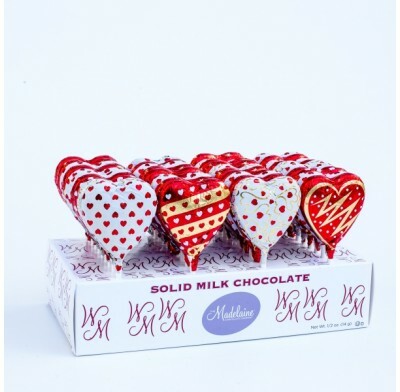 Valentine Chocolate Heart Pops by Madelaine are cute and charming heart-shaped pops wrapped in festive red, white and pink Italian foil. Made from solid all natural premium milk chocolate, Madelaine Chocolate Heart Pops will satisfy the taste buds of the most avid chocolate connoisseur and fill their heart with sheer and simple joy. Offer these heartwarming treats in gift bags, as wedding favors or for anniversaries, or simply to stock the shelves of your retail store. Packaged Valentine Chocolate Heart Pops come 24 pieces per counter display and each pop is ½ ounce. Kosher Dairy. Sweet City Candy is your wholesale candy headquarters. Enjoy Valentine Chocolate Heart Pops in bulk delivered fast, right to your door at low wholesale prices. If you can't find the candy or chocolate you are looking for, contact us and we will be happy to help you in any way we can.